Do you have a passion for taking care of others and an interest in joining the flourishing healthcare field? If so, an affordable online health science degree may be for you. The healthcare industry in the U.S. is growing faster than many other sectors of the economy. Advances in technology have contributed to explosive growth in our understanding of medical science, and our population continues to age. According to the U.S. Bureau of Labor Statistics, job growth in healthcare occupations will continue to grow by 19% through 2024. This rapid expansion has created a need for leadership and management skills in jobs that previously didn't require them. Allied health professionals like respiratory therapists, physical therapy assistants, and audiologists are being called on to assume supervisory and administrative roles in addition to patient care. Previously, their educational requirements left them unprepared for these responsibilities. Enter the health science degree. An online health science degree program is designed to deliver a broad understanding of the biological and social sciences, global public health, and humanities. Alongside this multidisciplinary approach to health sciences, these programs deliver the knowledge and skills necessary to perform leadership roles in a clinical healthcare setting. This degree program is an excellent stepping stone to many graduate programs in the health sciences. In addition, it is particularly well suited to allied health professionals seeking a competitive advantage in today's healthcare workplace. 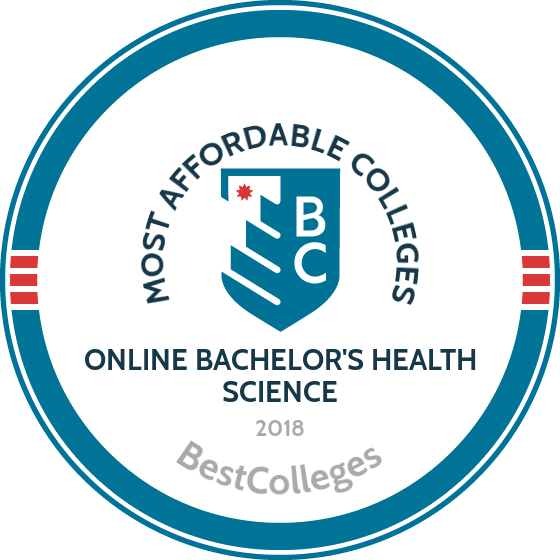 Below, you'll find our list of the most affordable online bachelor's in health science degree programs available today. We did not simply choose the cheapest online health science program in terms of tuition, but rather looked at overall affordability based on value as a return on investment. Factoring in a variety of metrics, our College Affordability Score has holistically identified the most affordable online programs in health science, making it easier for you to decide which school fits your needs. If you're thinking about returning to school for your degree, and are interested in taking classes online, be sure to take a look at these value-driven programs. Arizona State’s health science degree online program, the BAS in health sciences, includes courses such as nutrition and the media, biostatistics, and the cultural aspects of health. Graduates pursue careers in health care management, education, administration, and specialist supervision. The 120-credit program is typically completed over four years. Arizona State’s local relationships provides students opportunities to network and utilize the resources of prestigious institutes such as the Barrow Neurological Institute, Dignity Health, Health Care Sector Partnership, and Mayo Clinic. Applicants must have a minimum high school GPA of 3.0. The program is fully accredited by the Higher Learning Commission. Bellevue University in Nebraska offers an online health science degree: a BA in health science. The degree is also available with emphases in science or eldercare, the latter of which equips students with confidence and expertise to pass the National Association of Long-Term Care Administrator Boards exam. The 127-credit program requires 41 major credits and 50 elective credits. Courses include medical terminology, SOAP documentation, and HIPAA regulations. The university's Center for American Vision and Values requires that all students complete the three-part Kirkpatrick Signature Series. This nine-credit series focuses on American vision and values, tradition and change, and freedom and responsibility. APUC in San Dimas, California, was established in 1899 with the motto “God First” and maintains four cornerstone values: Christ, scholarship, community, and service. The university’s online degree in health science, the BS in health sciences, is fully accredited by the WASC Senior College and University Commission and offers six emphases: general psychology, health care leadership, health care management, human services, organizational dynamics, and psychology in the health care profession. Required courses include bioethics, research methods in psychology, and medical sociology. Of the program’s 120 credits, 60 are major or emphasis credits. Applicants must hold a minimum 2.0 GPA. APUC does not accept international learners. Texas Woman’s University was founded in 1901 and has admitted male students since 1972. TWU’s BS in health studies is accredited by the Southern Association of Colleges and Schools Commission on Colleges, Society of Public Health Educators, and the American Association for Health Education. The online bachelor’s degree program in health science requires a 360-hour internship, and its 120-credit curriculum is geared toward the MCHES and CHES exams. Available concentrations include master’s preparation and EC-12 certification. Applicants who have graduated from a Texas high school in the last two years within the top 25% of their class are assured admission. In other cases, TWU requires a minimum 2.0 GPA and considers SAT or ACT scores. Based in New Brunswick, New Jersey, Rutgers offers a BS in health sciences. The online bachelor's degree in health science includes specialization tracks in aging, allied dental education, diagnostic imaging technologies, health advocacy, management and education, and psychiatric rehabilitation. The program is flexible and customizable, but most students complete the 120 required credits in ten semesters, or four years. The curriculum comprises 80 general education credits and 50 health science credits. Students of all tracks must complete a 15-credit interdisciplinary core, and allied dental education students complete 40 additional credits. Applicants must have at least a 3.0 undergraduate GPA. Based in Fort Myers, Florida, FGCU offers an affordable health science degree online program; the BS in health sciences is fully accredited by the Southern Association of Colleges and Schools Commission on Colleges. Of the program’s required 120 credits, 45 credits comprise major courses, such as human resource management in health service organizations, financial management, and risk management. Students complete a supervised practicum, allowing them to apply classroom skills and knowledge to real-life situations and preparing them for health science careers following graduation. Students must complete at least 48 credits through FGCU and must maintain a cumulative GPA of 2.0. Mizzou offers an entirely online health science degree program: a BSH in health science. The program requires 120 credit hours and is fully accredited by the Higher Learning Commission. Mizzou’s affordable online health science degree allows working health professionals to further their careers by earning certifications and qualifications for positions in administration, leadership, and supervision. Graduates work in health care, as well as related commercial industries such as pharmaceutical manufacturing and distribution. The program features practical courses such as medical case management and public health principles and practice. The program is delivered in an asynchronous format, ideal for those with professional and personal commitments. Based in Colorado Springs, the University of Colorado offers an online BS in health care science with an option in allied health. The bachelor's in health science online program requires 120 credit hours, 30 of which must be completed through UCCS. Health science prerequisites, such as human anatomy & physiology, account for 19 credits, and health science core classes, such as health behavior change, account for 12 credits. UCCS recommends the BS in health care science be completed in four years, or eight semesters. Students have access to the prestigious Kraemer Family Library, and online courses are delivered through the Blackboard learning platform. Based in Columbus, Ohio State offers an affordable health science degree online program. The BS in health sciences is available fully online, with no on-campus requirements. The program requires 120 credit hours, 30 of which must be completed through Ohio State. Most students complete the program in four years, or eight terms. The curriculum covers sociology, psychology, and medical terminology. Core class requirements include community and policy influence in health care, individual differences in patient client populations, and the application of ethical decision making in health care. Applicants must hold a minimum GPA of 2.5 and should have an aptitude for mathematics and sciences. MCPHS, based in Boston, offers an online health science degree, a BS in health sciences degree completion program, each fall. The program offers three tracks: general, health education, and health care management. The health education track includes courses such as planning health education and promotion, while the health care management track includes courses such as managerial accounting and health care marketing. Several courses are lab-based. Students with 12 or more prior credits may transfer into the first or second year of the program, but speak to admissions to ensure your credits are in line with MCPHS’s requirements. Second-year courses include anatomy and physiology and algebra and trigonometry. Based in Pensacola, UWF offers online bachelor’s degree programs in health science, including a BS in health sciences, which leads to the public health certification. Of the 120 required credits, at least 48 upper-division credits must be earned through UWF. General education courses cover algebra, statistics, anatomy and physiology, and psychology. The program requires 60 health sciences credits in areas such as end-of-life ethics and the epidemiology of infectious disease. Students may specialize in health care administration, with focus on quality improvement and strategic planning, or public health, which requires courses such as medical disaster management. Applicants must hold a minimum 2.5 GPA on prior college credit. North Arizona University in Flagstaff has offered health sciences degrees for more than 50 years and now offers an online bachelor's degree in health science. The BS in health sciences program requires courses such as organization & administration and leadership and interprofessional team work for health professionals. Students may transfer up to 90 lower-division credits from a regionally accredited institution. The 120-credit program requires at least 30 credits to be completed through NAU, 18 of which must be upper-division credits. Applicants must hold a cumulative GPA of 2.5 from prior post-secondary studies or have graduated from an associate degree program in a relevant field. Based in Toledo, Ohio, MCO’s affordable health science degree online program is fully accredited by the Higher Learning Commission. Students may begin the BS in health care administration completion program during three terms per year. The program requires 39 credit hours of professional coursework, and transfer students may bring up to 45 prior credits. Students may choose to complete a 120-hour practicum elective. Founded in 1911 by the first bishop of Toledo, MCO offers resources to support students’ Catholic faith and Christian values, conforming to the ethical and religious directives for Catholic health care services by the United States Conference of Catholic Bishops. Applicants must have a minimum GPA of 2.3. Based in New Castle, Delaware, Wilmington University offers a cost-effective BS in health sciences in fully online and hybrid formats. Hybrid students complete in-person components at New Castle, Dover, or Georgetown. WU’s four-year online health science degree is also available as a degree completion program, allowing transfer students to bring up to 75 credits from previous studies. Graduates pursue careers in health care quality improvement or as medical research assistants. The program’s health sciences core accounts for 24 credits and covers subjects such as the ethical and legal issues of health care and leadership for health care professionals. Natural sciences comprise 16 credits, and health science electives account for at least 18 credits. GSC is based in Concord, New Hampshire, and accepts rolling applications for its BS in allied health leadership program. The online bachelor's degree in health science is fully accredited by the New England Association of Schools and Colleges. Foundation courses include community, culture and health or managing diversity, law and ethics for health care and human services, and human resource administration. A variety of elective options allow students to customize the degree. Applicants must have a minimum 2.0 GPA and must submit GED, HiSET, or TASC results. A minimum of 30 credits must be completed at GSU. The majority of GSU’s graduates are transfer students, and career and admission counseling are available. NKU offers a fully online health science degree: the BS in health sciences, available in clinical‚ nonclinical, and transdisciplinary tracks. Specialization courses are available in areas such as clinical health informatics and IT project management, and practicums are offered in areas such as advanced imaging. Applicants must hold an associate of applied science degree or equivalent in a relevant field, as well as a minimum 2.3 GPA, and be registered health care workers. The online transdisciplinary track requires a minimum 2.5 GPA and completion of 30 on-campus credit hours prior to online studies. Students may begin the program in spring or fall semesters. Based in Vermillion, USD offers an online BS in health sciences, which is available in six concentrations: pre-professional studies, health care studies, health care advancement studies, undergraduate clinical informatics, undergraduate public health, and undergraduate research. Courses include professional communication and relationship-centered care, promotion & policy of native peoples’ health care, and alcohol & drug use in diverse populations. USD’s program features a strong focus on native peoples, as well as a unique medical Spanish course. Applicants should have a composite ACT score of at least 21, or a 990 SAT, and a minimum 2.6 GPA. The 120 required credits include 44 major credits, 49 elective credits, and 32 upper-division credits. Based in Fort Lauderdale, Florida, NSU offers an online bachelor’s degree program in health science; the BS in health sciences is available in four tracks: general health, health care administration, pre-master’s of occupational therapy, and pre-doctor of occupational therapy. Core courses include conflict resolution in health care, epidemiology, and leadership development. Of the 120 required credit hours, up to 60 credits comprise elective courses, such as examining torture, violence and trauma, sports medicine, and Chinese medicine. Applicants should hold an associate degree in health studies from a regionally accredited university or a health care certification and should have a minimum 2.6 GPA. Students may transfer up to 30 credit hours from general education and clinical courses. The program has four start dates and rolling admissions. Based in Natchitoches, Northwestern State has offered employment-orientated study since 1993. Its affordable health science degree online program is fully accredited by the Southern Association of Colleges and Schools Commission on Colleges. The BAS in health sciences is available fully online, with no on-campus requirements. Graduates work as allied health professionals. Students may transfer in up to 30 hours of clinical and general education course credits. The program’s 33 hours of core credits focus on physical, biological, social, and behavioral subjects. Because of its three-semester academic year, students may complete the program at an accelerated pace. Applicants must provide ACT or SAT scores. Since its founding in 1884, Philadelphia University has offered market-oriented education, such as its online bachelor's degree in health science. Graduates of the BS in health services management pursue careers in hospital administration and health care team leadership. Program requirements include professional education core courses, such as economic decision making. Major concentration courses include cross-cultural communication and diversity management. General education focuses on practical development, with courses such as professional communication skills and the social science of the workplace. Most students complete the 120-credit program in two to three years. Applicants must have a minimum of 30 transferable credits; Philadelphia University will accept no more than 72 transfer credits. Founded in 1897, BPU in Longmeadow, Massachusetts, offers a BS in health sciences. Students earning this affordable health science degree online may transfer up to 15 health care or sciences credits. The program is designed to help current health care professionals advance to careers as administrators or managers. The program has six start dates throughout the year, and students may complete the degree on a full-time or part-time basis. The program is available fully online or in a hybrid format with on-campus Saturday classes. Students may accelerate their degree by opting to complete courses in six-week sessions, ideal for working professionals with busy lives. National University, based in La Jolla, California, offers online bachelor’s degree programs in health science, including the BS in allied health leadership. Required courses include case and outcomes management and issues and trends in health care. Students complete a two-month capstone project and a collaborative learning experience in the local community. Upper-division courses include chronic and communicable disease and health IT virtual simulation. The degree requires 120 credits, 30 of which must be completed in residence at National University. Upper-division and general education courses each account for 50 credits. Students may earn a concentration in health informatics; required courses include health information exchange. Based in Manchester, SNHU offers an online bachelor's degree in health science. The 120-credit BS in health sciences is highly customizable, allowing students to specialize in their career focus. Elective courses include ethical and legal considerations of health care, health care delivery systems, and health care quality management. General education requirements include social and behavioral sciences, and students also complete a capstone course. Students may transfer up to 21 credits from an associate degree in an allied health discipline. SNUH offers competitive scholarships. Active-duty military servicemen and spouses receive discounted tuition. The health sciences program is fully accredited by the New England Association of Schools and Colleges. UIW in San Antonio, Texas, offers students a low-cost option for earning a bachelor's in health science online. The BS in health sciences is available in three concentrations: general studies, nutrition, and administration. The general studies concentration is designed primarily for those with military backgrounds, allowing students to transfer up to 18 credit hours from military training. The nutrition concentration features courses such as integrated approach to weight management. The administration concentration offers courses in management, such as organizational behavior and leadership. Each track requires 33 credits of core courses, such as information systems for the health sciences. UIW also offers a broad range of certifications, such as cardiac rhythm analysis technician, certified medical administrative assistant, certified billing and coding specialist, and certified electronic health record specialist. CUP offers a fully online BS in allied health leadership, accredited by the Middle States Commission on Higher Education. CUP’s online bachelor’s degree program in health science is a low-cost option with great flexibility; the program has six academic terms each year. General education courses account for 48 of the 120 required credits. Students complete up to 60 major credits and up to 18 credits in specialized courses—such as human resources management and principles of marketing—which develop administration and leadership skills. Other required courses include economics and business statistics, along with general education courses such as social and behavioral sciences and physical and biological sciences.